LAS VEGAS—Behold the PCs of CES 2013. They are simpler, smarter, easier to use, and more portable than their now ever-so-clunky predecessors. No mice or keyboards are required. Indeed, these are not your daddy’s computers. And let's not even call them PCs. How about: Tablets, hybrids, all-in-ones, and even Table PCs. Bottom line: Most PCs in Las Vegas this week make the hulking desktop PCs of yesteryear look like machines only Bill Gates could love. A funny thing has happened to PCs over the last 10 years, and the trends are most obvious if you look at personal computing through the spectrum of CES. It’s been a slow, winding road, but PCs are finally beginning to achieve an almost appliance-like simplicity. Microsoft deserves part of the credit, with its versatile Windows 8 OS, which runs on everything from traditional desktops to tablets to hybrid laptops. Sure, using the system itself presents a learning curve, but by unifying so many different types of devices under a single OS experience, Microsoft finds “learning efficiencies” in a multi-device ecosystem. Credit also goes to chipmakers AMD, Intel, and Nvidia for improving graphics, battery life, and CPU speeds—all without sacrificing performance on the altar of ease of use. And PC makers themselves have also stepped up, introducing easier-to-use industrial design. As I spoke with PC chip and hardware makers here at CES 2013, it’s clear that simple is where it’s at. Here are just a few examples. A lot about the PC's form factor has changed over the past decade. The road from beige boxes to slim tablets is easy to chart. Less obvious is how the guts of the PC have evolved – namely with things such as the graphics processing unit (GPU). It wasn't so long ago that playing a PC game out of the box delivered a low resolution, muddy mess. Gamers were left to try to optimize resolution via jargon-filled menu settings. The problem was game developers couldn't account for the vast range of performance differences between PCs. Nvidia’s solution: the GeForce Experience. GFE uses a huge, cloud-based database of system configurations to auto-set graphics settings for PC games. Users don’t know there’s a giant database, nor are they aware of the algorithms built into GFE to check and set game configurations. It all runs in the background. Nvidia is using big iron servers in the cloud to make life easier for PC gamers, who will have no idea how much horsepower and data is committed to making their games run better. GeForce Experience delivers optimal game settings with one click. At CES, Intel took the wraps off plans for tablets and Ultrabooks for the upcoming year based on the fourth-generation Haswell chip architecture. The big news was Intel's North Cape reference design, which is a model for what Ultrabooks could be in 2013. North Cape prototypes I looked at are slim, run all day on one charge, and come with a detachable display that morphs into a 10mm Windows 8 tablet. Now you don't have to feel the sting of buying a laptop and regret not buying a tablet. Intel has always supplied reference designs to hardware manufacturers, but those have rarely seen the light of day. However, Intel’s reference designs have gotten slicker over time, and such is the case with North Cape. So now PC makers can more easily take those reference designs, and with just a few modifications go right to market. We can debate the success of Ultrabooks with consumers, but one thing you can't deny is how Intel has helped PC makers, from Dell to smaller manufacturers, go to market faster. Intel’s Haswell convertible laptop reference design is as good as any PC manufacturer's design. Few families huddle around the PC or tablet to play games with one another in the living room like they would with an old-time board game. Digital lifestyles can isolate people, but Lenovo's 27-inch IdeaCentre Horizon Table PC could redefine family time. Lenovo blasted into CES with a slew of new PC products. But Lenovo's most interesting (if not daring) piece of hardware was the IdeaCentre Horizon Table PC. The Horizon uses mobile PC components plus a big battery to create a semi-portable all-in-one PC that a family can place on a table for games and other face-to-face activities. Lenovo says it will offer furniture designed to mount the Horizon. The personal computer as furniture is fully realized. Lenovo’s IdeaCentre Horizon is the tabletop PC realized. Design simplicity is something we associate with Apple and its designer Jonathan Ive, not PC makers. Don't tell that to electronics maker Vizio. In my review of the Vizio CT14-A2 laptop, I compared the design aesthetic to the Bauhaus school of design, which emphasized the intersection of minimalism and functionality. The entire lineup of Vizio laptops look similar, have similar keyboards, and offer minimal, uncluttered Windows 8 installations. 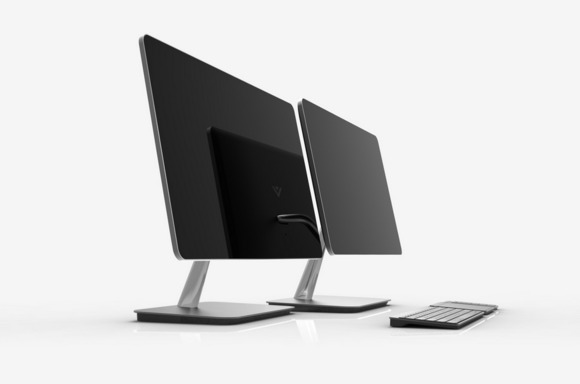 Vizio’s desktops, HDTVs, and home theater equipment at CES are similarly simple and elegant. Great industrial design doesn't automatically equal ease of use. But for a long time PC makers bucked Apple's notion of simple design and function. Instead, PC vendors seemed to think the more drives, buttons, ports, and fold-out screens you could cram into a laptop, the better. Vizio uses a common, simple design on all its laptops. The PC industry’s past attempts at building simple, easy-to-use products tended to ape the classic consumer electronics industry. In the last couple of years, however, PCs have created their own aesthetic, embracing simplicity by taking advantage of the capabilities of modern components, cloud computing, and better software. If anything, the PC business has overtaken the classic CE business with better functionality that’s more usable than ever. PCs aren't PCs, in the traditional sense. This year, as Windows finds its way into tablets, hybrids, and living room all-in-ones, the PC has become a rock star-caliber attraction here at CES. The PC is on a roll.